Renal involvement due to European Puumala virus (PUUV) is frequent but pulmonary involvement is quite rare. We present here, a 24-year-old male with atypical clinical presentation of acute PUUV infection with gross pulmonary and minimal renal involvement. Severe pulmonary manifestations of PUUV infection, in this case, highlights that hantavirus infection should be considered in the differential diagnosis of atypical pneumonia. Hantaviruses are ribonucleic acid viruses belonging to Bunyaviridae family. They have a widespread distribution throughout the world. Recent studies have also reported the emergence of Hantaviruses in India. Hantavirus infections in humans present as two distinct clinical forms: hemorrhagic fever with renal syndrome (HFRS) and hantavirus pulmonary syndrome (HPS). Recent publications have revealed that there is not always a sharp border between these two clinical forms and a clinical overlap may exist. Renal involvement due to European Puumala virus (PUUV) is frequent but pulmonary involvement is rare. Although varying degrees of pulmonary involvement have been described in PUUV-infected patients, severe pulmonary manifestations are uncommon.,, We report a case of bilateral massive pneumonia as an unusual manifestation of PUUV. A 24-year-old male presented to the emergency department with a 3-day history of fever, fatigue, and severe headache. He had been living in a rural area and had been working in a forest for 1 month where he got wet in the rain 3 days before his presentation. History of tick and rodent contact was unclear. His medical history was positive for six pack-years of cigarette smoking. His family history was unremarkable. On physical examination, his temperature was 39.1°C, heart rate 92/min, blood pressure 120/70 mmHg, and respiratory rate was 16/min. His throat and conjunctiva were hyperemic and tongue and mucosa were dry. Pulmonary sounds were normal on auscultation. Spleen was palpable below the left costal margin. Other physical examination findings were normal. Laboratory values were white blood cell: 7.3 K/uL (n = 4–10.5), hemoglobin: 14.6 g/dL (n = 12-17.5), platelet: 34,000/mm3 (n = 140,000–450,000), urea: 18.7 mg/dL (n = 16.6–48.5), creatinine: 0.81 mg/dL (n = 0.7–1.2), alanine transaminase: 21 U/L (n = 0–41), aspartate aminotransferase: 39 U/L (N: 0-40), creatine kinase: 375 U/L (n = 39–308), and C-reactive protein: 59.5 mg/L (n = 0–5). HIV was negative. Urinalysis showed mild proteinuria and microscopic hematuria. Chest X-ray was within normal limits. Abdominal ultrasound showed a mild increase in the long axis of both kidneys and splenomegaly (long axis of spleen: 143 mm). He was admitted to inpatient clinic with a presumptive diagnosis of acute respiratory system infection. After collection of blood and urine cultures, ceftriaxone intravenous was started empirically. Serum samples were sent to the National Arboviruses and Viral Zoonoses Reference Laboratory to rule out Crimean-Congo hemorrhagic fever and hantavirus infection. Platelet transfusions were given to treat the thrombocytopenia. On the 3rd day of hospitalization, he suddenly developed severe dyspnea, massive dry cough and a dramatic decrease in oxygen saturation which was 79% on a finger pulse oximeter. During the deterioration, his blood pressure was normal (110/70 mmHg), platelet count was 67,000/mm3, renal function tests were urea: 28 mg/dL, creatinine: 1.51 mg/dL. Liver function tests and coagulation profile were in normal limits. On oxygen supplementation, arterial blood gas analysis was: pH: 7.43 (n = 7.35–7.45), PaCO2:29.9 (n = 35–45), PaO2:53.2 (n = 60–100). There was no hemoptysis. To rule out pulmonary embolism, computed tomography angiography of the thorax was done. There was no evidence of pulmonary embolism, however, bilateral extensive infiltrations and bilateral pleural effusion were detected [Figure 1]. As the patient had no finding of hemodynamic instability such as hypotension or bleeding, clinical exacerbation was thought to be related to impaired pulmonary ventilation due to infective process rather than pulmonary hemorrhage. Mild clinical and laboratory findings despite severe radiological findings suggested atypical pneumonia as the diagnosis. Intravenous moxifloxacin was added to the treatment. Then, the patient was referred to a tertiary care hospital due to possible risk of acute respiratory distress syndrome and admitted to its intensive care unit. Treatment was continued with ampicillin/sulbactam, clarithromycin, and oseltamivir. The next day, he was transferred to the ward as there was improvement in his clinical status. His renal function tests and arterial blood gas analysis returned to normal. There was no growth in blood and urine cultures. Legionella urinary antigen was negative. 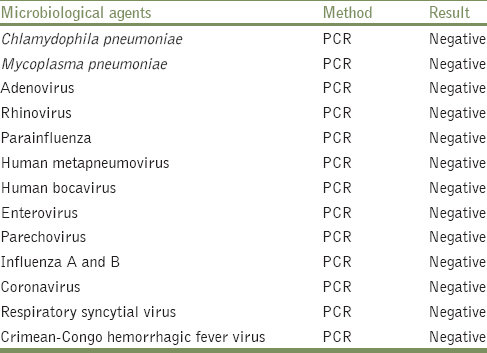 Other relevant microbiological agents were all negative [Table 1]. Hantavirus IgM and IgG were positive on indirect immunofluorescence assay (Anti-Hantavirus IIFT, Euroimmun, Germany) immunoblot analysis (Antibodies against antigens of Hantavirus, Hanta Profile 1 Euroline, Euroimmun, Germany) and evaluation of the test strips using EUROLineScan program. The sensitivity of the Anti-Hantavirus IIFT test is reported to be 96% for IgM and 99% for IgG and the specificity 100% for IgM and 98% for IgG. The sensitivity of the Hanta Profile 1 Euroline IgM test is reported to be 91.4% for IgM and 84.5% for IgG, and the specificity 86% for IgM and 95.1% for IgG by the manufacturer. The serotype of the virus was detected as Puumala. Immunoblot strips and evaluation form images are shown in [Figure 2]. After a 10-day hospital stay, the patient was discharged on oral cefdinir and clarithromycin. At 1 month follow-up, he was asymptomatic and his blood tests and computed tomography of the thorax were normal. At 2 months follow-up, antibody levels against hantavirus were increased by four-fold on immunofluorescence assay. Thus, the final diagnosis in our patient was HPS due to PUUV. Hantavirus infection usually shows a chronic asymptomatic course in rodents. It is transmitted to humans through contact with infected rodents or their urine and droppings. The infection probably had been transmitted to our patient by inhalation of infected rodent droppings while working in the forest. Hantaviruses infect the endothelium, and the infection is systemic with varying organ involvement. Renal failure and pulmonary edema are the most serious complications of HFRS and HPS respectively which can be life-threatening.,, Our patient developed bilateral massive pneumonia during acute PUUV infection. He completely recovered with antimicrobial and supportive treatment. Renal involvement due to PUUV is frequent but pulmonary involvement is quite rare. Although varying degrees of pulmonary involvement have been previously described in PUUV-infected patients,,,,,,,, severe pulmonary manifestations are uncommon, and there is almost always prominent renal involvement.,, The pattern of lung involvement in hantavirus infection is characterized by interstitial edema and alveolar disease with central or bibasilar involvement. Pleural effusion is also a frequent finding. 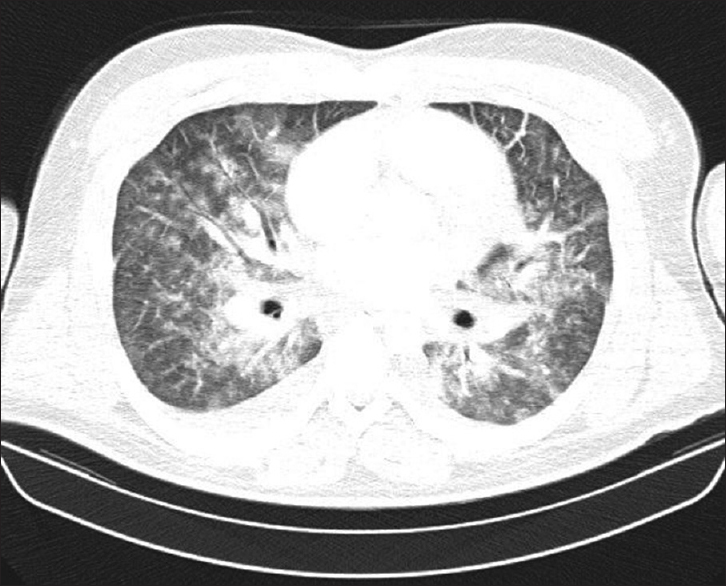 Radiological findings of our case were consistent with pulmonary capillary leak seen in HPS. However, the massive pulmonary involvement along with the mild renal involvement in this particular PUUV case was unusual. By reporting this case, we wish to emphasize that hantavirus infection should be considered in the differential diagnosis of atypical pneumonia. The absence of prominent renal involvement offers a challenge to the clinician to make the diagnosis. The authors certify that appropriate patient consents were obtained. Chandy S, Mathai D. Globally emerging hantaviruses: An overview. Indian J Med Microbiol 2017;35:165-75. Jonsson CB, Figueiredo LT, Vapalahti O. A global perspective on hantavirus ecology, epidemiology, and disease. Clin Microbiol Rev 2010;23:412-41. Rasmuson J, Andersson C, Norrman E, Haney M, Evander M, Ahlm C, et al. Time to revise the paradigm of hantavirus syndromes? Hantavirus pulmonary syndrome caused by European hantavirus. Eur J Clin Microbiol Infect Dis 2011;30:685-90. Clement J, Maes P, Van Ranst M. Hemorrhagic fever with renal syndrome in the New, and Hantavirus pulmonary syndrome in the Old World: Paradi(se)gm lost or regained? Virus Res 2014;187:55-8. Gizzi M, Delaere B, Weynand B, Clement J, Maes P, Vergote V, et al. Another case of “European hantavirus pulmonary syndrome” with severe lung, prior to kidney, involvement, and diagnosed by viral inclusions in lung macrophages. Eur J Clin Microbiol Infect Dis 2013;32:1341-5. Linderholm M, Sandström T, Rinnström O, Groth S, Blomberg A, Tärnvik A, et al. Impaired pulmonary function in patients with hemorrhagic fever with renal syndrome. Clin Infect Dis 1997;25:1084-9. Kanerva M, Paakkala A, Mustonen J, Paakkala T, Lahtela J, Pasternack A, et al. Pulmonary involvement in nephropathia epidemica: Radiological findings and their clinical correlations. Clin Nephrol 1996;46:369-78. Caramello P, Canta F, Bonino L, Moiraghi C, Navone F, Lipani F, et al. Puumala virus pulmonary syndrome in a Romanian immigrant. J Travel Med 2002;9:326-9. Seitsonen E, Hynninen M, Kolho E, Kallio-Kokko H, Pettilä V. Corticosteroids combined with continuous veno-venous hemodiafiltration for treatment of hantavirus pulmonary syndrome caused by Puumala virus infection. Eur J Clin Microbiol Infect Dis 2006;25:261-6. Rasmuson J, Lindqvist P, Sörensen K, Hedström M, Blomberg A, Ahlm C, et al. Cardiopulmonary involvement in Puumala hantavirus infection. BMC Infect Dis 2013;13:501. Johnstone J, Majumdar SR, Fox JD, Marrie TJ. Viral infection in adults hospitalized with community-acquired pneumonia: Prevalence, pathogens, and presentation. Chest 2008;134:1141-8.